I spent my off weekend in Atlanta at a leadership conference for college-age women. No, y’all, I know how old I am, and I am fully aware I graduated from A&M 30 years ago this May…roll with my story here, please. 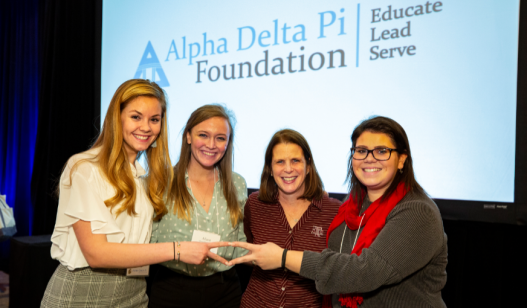 The first thing I want to say about Adelphean Compass is I am a bit envious of my collegiate sorority sisters who spent their weekend learning how to lead with self, as well as how to lead with vision, action, and relationships. At age 20, they are receiving information most of us have spent many, many years learning (and often getting not-quite-right along the way). It was POWERFUL seeing that many young women learning how they can be more effective in the roles they are taking on in this world. On Saturday evening, I had the privilege of being part of a panel designed to share how we amplify those around us and how we amplify core messages. I got to do this with two other amazing alumnae – Aly Merritt and Rae Ann Gruver. The three of us had never met before that afternoon, and I’ll tell you with all honesty…these are women who I want as “marble jar” friends. They’re smart, they’re funny, they’re fully themselves, and they have such love for the work they are doing in the world. Now that I have had a few days to get out of the glow of the weekend, I’ve gathered a few lessons based upon things all three of us told the audience in one form or another. So what were my take-home messages that I heard? In your life and in your career, there will be plot twists. You can’t predict what they will be, but if you listen closely as they happen, they may help guide your purpose and your passions. Getting where you are going in life? There’s no Google Maps for that. It’s more like a “choose your own adventure,” and sometimes you’re just winging it. That’s okay. Do it scared. I am certain that at various points in our journeys we each discussed we have been terrified of what we were doing. Each of us did it anyway, and so far it seems to be turning out just fine. Thanks for sharing your personal and authentic message, Amalia!